Available to all Werma practitioners. 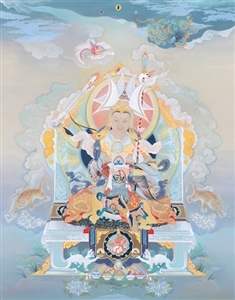 The Imperial Rigden is the embodied treasury of all Shambhala wisdom and the active force manifesting enlightened society. This archival quality reproduction of the painting is particularly relevant as a visual aid for the self-visualization in the Werma Sadhana. Larger sizes available by Special Order Here.